Some Two Towers sets were big models called "bigatures"
He has worked on such well-received films as Jurassic Park, Mission Impossible and Magnolia. So it is hard to believe that visual effects supervisor Joe Letteri has only just received his first Oscar win. 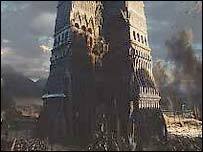 And this weekend, he will be waiting to see whether he, along with fellow nominees Jim Rygiel, Randall William Cooke and Alex Funke, will take home the award for Best Visual Effects for their work on The Two Towers. 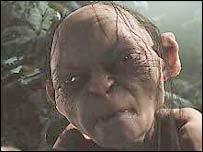 The groundbreaking effects on the film - including the creation of Gollum, a computer generated character based around the movements of actor Andy Serkis (who provides the voice) - have made it an obvious choice for Oscar recognition. Before the win, Letteri was remaining non-committal about his chances. "It's hard to say, you never know how the Academy is going to vote," he said. "But the feedback we've got from colleagues is that people think the work is outstanding. "So hopefully the Academy as a whole will share that feeling, but who knows. "So far most of my preparations have just been your typical travel plans, only with a few nicer changes of clothing involved." Letteri, a veteran of George Lucas' effects company Industrial Light And Magic, has spent the past year and a half working on the trilogy, at the Weta Digital facility in Wellington, New Zealand. The company, co-founded by Rings director Peter Jackson, is about to begin work on the final film in the trilogy, The Return Of The King. "We're actively in production, but we're just at the stage right now of assembling all the pieces and getting the first look at some of the sequences we'll have to do," said Letteri. "I think one of the things we can expect is that it's going to be a good, solid film." And as with the first two films, the effects and techniques used are constantly evolving. "The effects are something we figure out every time we're faced with a new scene or character. "Obviously with Gollum, once we took the initial designs of the character and actually started placing it in The Two Towers, we had to do quite a lot of re-design to get him to perform that way." "He was a great character. Peter really understood how to direct him as an actor, not as a character creation, so we had a script for him and he was treated as realistically as possible." With the project finally due to come to an end this year, Letteri is looking to the future at Weta, which since Lord Of The Rings has unsurprisingly attracted attention from Hollywood. "We would all like to be here if Peter Jackson decides he'd like to do some more films. But we've got a really good crew here, a really good capability to do some good visual effects, so we will be available to other directors." But he admitted he will be sorry to bid the trilogy farewell. "There are people here who have been working on it for the last five years, who are starting to realise that it's all going to come to an end. It's really quite a family that's developed here."